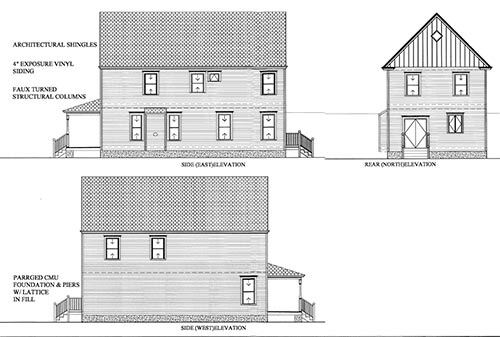 The Historic District Review Board approved an application for a Certificate of Appropriateness for new construction of a single-family dwelling at 231 Randolph Avenue. The application is for a single-family home, built on a conforming size lot. The building footprint meets the setback\prevailing standard requirements of the zoning ordinance. This is a two-story, nineteen hundred and eighty-eight (1,988) square-foot, stick-built home and will have four-inch vinyl siding. The building is proposed to have a shingle roof, a cement block foundation with a pargeted finish and lattice infill is proposed. Guidelines’ Windows and Doors section.